Rapidement avant d'aller au dodo, j'ai terminé ma carte pour Fiston! J,ai utilisé le magnifique sketch proposé par Just Magnolia, et cette image d'Edwin, que j'adore, présentement en commande chez Magnolia-licious... Tiens donc, probablement qu'il va faire une petite ballade à vélo, pour retouver son calme, après cette aventure avec Tilda...Comme il est très tard, je vous présente ma carte sans plus tarder. Just before I go to bed, I finished my card for Fiston ( nick name of our eldest son). I used the beautiful sketch suggested byJust Magnolia and this image of Edwin, that I like very much, presently in order at Magnolia-licious. Étape/stamp: Edwin on bicycle, from Magnolia-licious presently on reorder, Cette étampe est présentement en commande. J,ai utilisé les encres à l'alcool noir et rouille sur les attaches parisiennes étoiles originalement dorées. Alcool inks in black and rust were used on the stars, originally gold. Dan!!! What a gorgeous card!! Your coloring is marvellous! Fiston will love it for sure, it´s absolutely amazing.I love those stars, too much! They are meaning that your son is always a star for you, Am I sure?? I wish him a lot of joy and fun in his day among all his friends and family!! 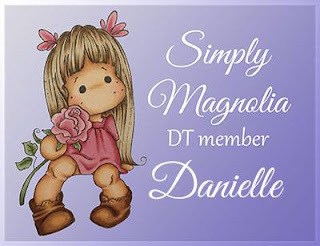 Wonderful card for your son Danielle! I'm sure he will love it because you made it for him! Great job on the sketch and added embellishments!!! Terrific card! Danielle, you have such a creative mind!! Your son will love this beautiful card - everything is perfect - the layout, papers, embellies and, of course, the fabulous colouring! Your card is amazing! Great job on the coloring and I love how you used the embossing folder. Hope your son has a wonderful birthday! elle est très jolie ta carte et j'adore l'embossage derrière ton Edwin avec l'effet de couleur. bravo! Danielle this is an awesome card you've made for your son! Love your coloring and choices of colors for your card. Your card is gorgeous! Love the colors you used on Edwin...perfect card for a boy or young man. Very nicely done! Danielle, what a perfect Edwin card!!!! Love the papers and the star embellishments! Your coloring of this cute image is magnificent. What a super card Dani! I love the dp you used, it looks so interesting. Then the star paper with the star embellies is fabulous. Your coloring is great! I think your wee laddy will be thrilled to recieve such a card! 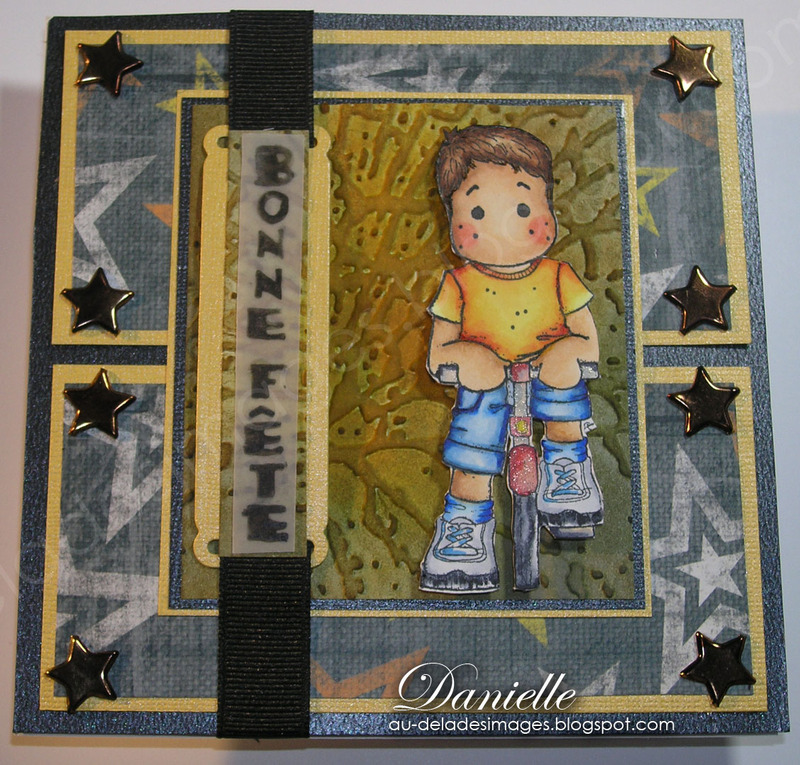 awesome boy card Danielle! Edwin is so extremely cute! Handsome Edwin card Danielle! Cute birthday theme and that embossed background looks awesome!! WOW Danielle, love your boy card, nice DP and match cute stars brad,and stunning coloring on Edwin too, I'm sure your son will love it. Nice trick with the sentiment, hope you don't mind if I "borrow" your idea, wink wink. Merci Dan. une autre merveille. Great card. Love the background behind Edwin. Très belle carte! J'adore l'étampe... et l'effet derrière le vélo! 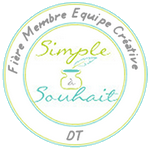 Superbe! You're coloring is fabulous, Danielle! I love the design of this and the papers are perfect! 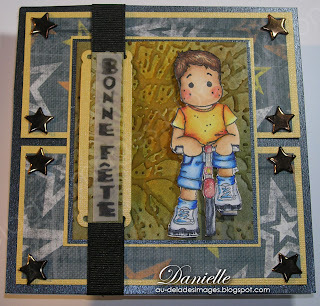 Danielle, This card is so lively and adorable...I love all your boy themes projects! This and that little boy fishing (card) are wonderful. I dont know why I dont have more BOY stamps ?!?! I have a boy and I always get stumped when I need to whip something up for him. I get STUMPED since the majority of my stamps are botanical.